I just got a new toy to add to my room! 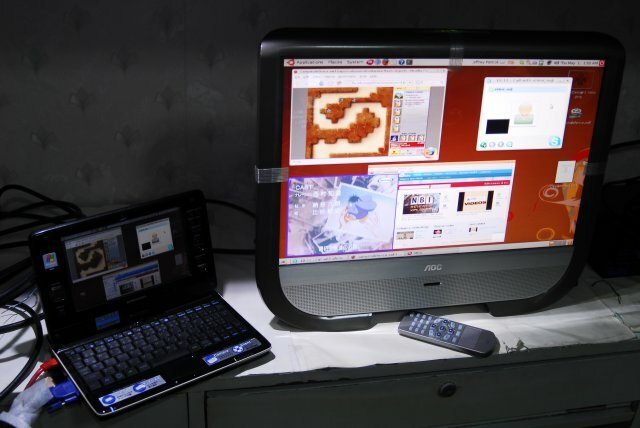 I have been looking out to buy a flat-panel LCD monitor for my desktop. My aging CRT monitor’s plug was already falling apart and the monitor was displaying pink. While I could breath a little bit more life into it by repairing it, I figured it was time to move up. 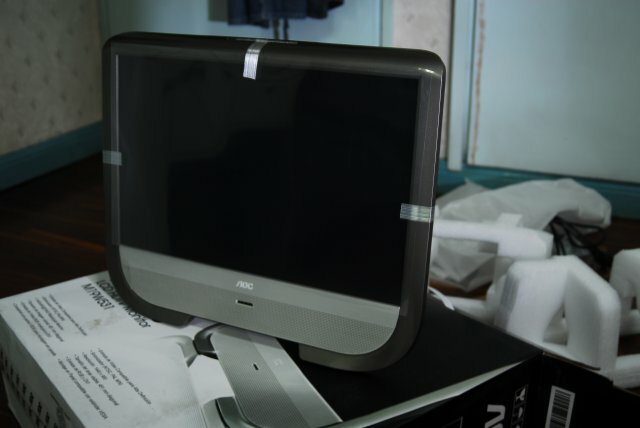 I’ve been looking around for a flat-panel monitor for 6 months, but since I had a long-term assignment in Japan, it would be gathering dust and cobwebs if I had bought one last year. And thank goodness I didn’t! My initial choice was a 19-inch widescreen Samsung. But when I was already about to get one, the store guy recommended that I get this AOC instead, since the price difference was minimal. 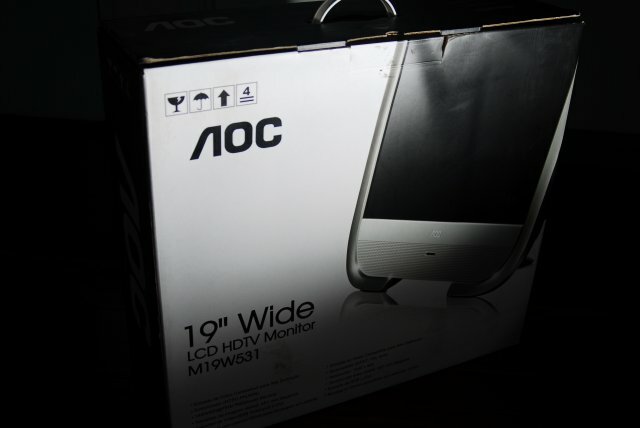 Aside from the 19-inch widescreen goodness, the AOC also had a built-in TV tuner and your standard-fare RCA and S-Video inputs, as well as DVI input for a full HDTV experience (if your hardware has it). Of course, it comes with a remote control. After trying it out at the store, I was pretty much convinced. After all, I didn’t have a TV in my room (my old TV was brought down to the living room). So now, not only do I have a space-saving flat-panel monitor for my PC, I can also play with my Wii from the comfort of my room! Plus the fact that I could pay for it slowly for 6 months through my credit card. Another cool thing is the picture-in-picture (PIP) function; it allows me to use it as a monitor AND watch TV at the same time (click picture to enlarge)! Sweet. Can your file manager do this? This is only one of the cool additions to Hardy Heron, the latest version of Ubuntu to come out. Other new features include Firefox 3 beta, modified in Hardy for stability, better hardware support, upgraded versions of all applications, Transmission BitTorrent client, and a nifty new wallpaper! You can now also try Ubuntu inside Windows like a regular application. No need to partition, and no harm to your system. Give it a try! For more details, check out the Ubuntu website. Update: The new File Operations manager now also offers the “merge” feature when overwriting folders. In Windows, if you choose to overwrite a folder, it will blindly overwrite all of its contents as well. With merge, you will have the option of confirming which files inside the folder will be overwritten. Cool! I saw a Kohjinsha SH6KP10A for only Y40K in Nipponbashi! I have seen the Kohjinsha quite a few times before, but never really paid attention because it was a local brand and was as expensive as a more powerful, albeit larger laptop. So coming home, I decided to do a little forward research on the Kohjinsha, specifically on Linux support. It only had an Intel A100 600Mhz processor (for reasons unknown to me, it’s faster than my 2.4Ghz main laptop), although it did have an Intel 945 GPU, which was perfect for 3D in Linux. If this thing could run a Vista, it would be quite fast when running Ubuntu. I compared the price vs. feature set with other UMPCs. TheSamsung Q1 was another favorite of Ubuntu users, but as it did not have a real keyboard (I need to be able to work on it; the optional keyboard attachment made it not so ultra-mobile, yuck). Searching the Ubuntu Forums yielded few, but very promising and helpful results. Checking them out, I found a few owners of Kohjinshas getting Gutsy on their UMPCs. It was only 40K yen if you were going to get a Yahoo!BB subscription with it. But at 60K, it was still a bargain, since it was only 6mos used and at half the price of a new one. And I got myself one last weekend. Taking it home, what was my first impression? First of all, it was preloaded with Vista, and instead of a recovery disc it had a 4GB recovery partition. I had to test all the hardware first to see if everything was A-Ok. Touch screen worked, webcam worked, the controls beside the screen (a lot of ’em: D-pad, track pointer, launcher, shutter, rotation, enter, brightnes. scroll keys. left and right mouse buttons), webcam, TV tuner, bluetooth and WiFi, all working perfectly. And you had no less than 3 ways to control your pointer: via the touch pad, the thumb pointer, and touch screen. As for text input, well you had the physical keyboard when you really need the typing speed, or you can use the touch screen. While it still had Vista, I decided to do a quick speed comparison test. Nothing fancy, just a quick test to see which OS would allow me to work more before I had to get off the train at the station. In short, boot times. Alright, so what are the real comparison figures for Ubuntu and Vista when both are installed in the hard disk? You could argue that the Vista desktop already appears at about 1:50, but you just can’t do anything with it yet for another 30 seconds, where you can *technically* do something e.g. click a button/menu, just don’t expect your computer to respond well. So Vista was out and Ubuntu was in, and without needing to install any drivers at all, the CF and SD card reader, controls beside the screen, the webcam, 3D card, sound, and most everything worked out-of-the-box and without my intervention. And from the info in the Ubuntu Forums thread I had found earlier, I was able to get Koji up to speed. So right now, I can type away on the train(where I wrote most of this post’s content yesterday on the train to Kyoto). Heck, I could do away with the typing altogether and just scribble away with Cellwriter. I don’t really need to say this but I’m one very, very proud Ubuntu-powered Kohjinsha owner! Stop what you’re doing and watch these! I found these series of Ubuntu videos on the ‘net titled First Impressions, Office Functionality, and Multimedia Support, and it’s unique because of who made them. John Bradbury is a, quote, “long-time Windows user and a Windows System Administrator” who is “pretty comfortable with all things Microsoft”, and so he’s out of his element as he reviews Ubuntu. The Multimedia Support video actually highlights improved codec handling, one of the features introduced in Feisty. Well, I’ll let you watch the video for yourselves to get a clearer picture. You have to watch these. I’ve added a new page to this blog, the Photo Gear page. Over there, I’ve written some insights and opinions on what type of gear you’ll need to start off shooting. Nothing specific, really, just what kind of gear, what to look for, etc. Hopefully, you’ll find something useful there. I’ve also upped some of my own gear over there in the form of photos. If you wanna know more about them, just click on the thumbnails. I’ll be uploading more of ’em as soon as I get around to taking shots of them, so check back often. That’s it for now, need to rush to my day job. Till next post! As I mentioned last post, I bought myself a real goodie from Akihabara. Something I’ve long been working for so it was high time to reward myself with this, ehem, investment. Ta da! Introducing the D200 from Nikon’s prosumer line. This hefty monster feels right in my hands, and the magnesium alloy body really feels solid, sturdy and can take a real beating before giving up the ghost. I was able to pick one up from Sofmap in Akihabara second-hand for a price almost half off of a tag price on the cheap price range (Hint: brand new body-only price is around Y160K). So why did I pick up a 2nd hand D200 instead of a brand new D40x which I could get for even less, lens included (I think I could have also afforded the D80 kit as well)? I was not looking for an entry-level camera. I’ve had prior practice on film with my trusty, if not comparitively simplistic, F55D film camera. So, while I knew that a ton of features do not a good picture make, at the very least I needed camera that can keep up with my needs. The D40 was also much more pickier with lenses, since their lens mounts do not have the built-in focus drive motors, and since I had a few lenses already, I did not want to put them out of use and invest in new AF-S and AF-I lenses. And while I often do manual focus, you will have to love the autofocus speed and control you get with the D200’s 11-area TTL focus. The D200’s built-in flash can also be used as a commander unit for use with Nikon’s Creative Lighting System. In other words, you can control an SB-600/SB-800 flash remotely without the need for additional equipment, save for the flash unit itself of course. The only other cameras that can do this is the D70, but it was already aging and has a smaller LCD screen. Well, so I was in Tokyo, THE big city of Japan. Aside from the TX1, I also bought myself my own Christmas/New Year/Anniversary present, but I’ll tell you more about it in my next post. For now, here’s a picture of Akihabara at night, taken from the TX1.